Accordingly, VisualSP—a leading user adoption and support provider for enterprise platforms—helps ensure SharePoint users can navigate the new interface and perform tasks easily without leaving the workspace. 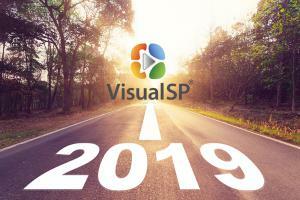 To support the range of interfaces presented by SharePoint 2019 and other recent versions, VisualSP has pursued innovation every step of the way. The Help System provides an always-relevant panel along the edge of every page, offering instant help and guidance to SharePoint and Office 365 end-users exactly at the moment of need. Not only does this help with onboarding new users, VisualSP also reduces the support ticket workload on the IT team. The VisualSP Help System can be licensed per user for Office 365 instances or per web front-end (WFE) for on-premises situations. Typically deployed as a provider-hosted solution, organizations with restrictive privacy or security policies can deploy the Help System behind their firewall. While many companies deploy SharePoint successfully, most struggle with making sure that employees actually adopt the platform, reducing the overall return on investment. The award-winning VisualSP system lowers the users’ barrier to entry by creating a Help tab that follows users around. It coaches users by providing access to native or custom created content including short videos, annotated screenshots, PDF tip-sheets, step-by-step walk-thrus and more. This contextually based content allows users to easily complete daily tasks without searching for assistance. The learn-by-doing approach embedded in VisualSP effortlessly promotes organic and sustainable user adoption throughout the organization. “Companies that have already achieved a certain breadth and depth of user adoption tend to leverage the power of VisualSP to help ensure other essential objectives, such as better governance, data security, and regulatory compliance", adds Rehmani. "When talking to our customers, one thing we hear is their need to stay in front of the innovation curve. That's why we always start working on upgrades way before a new version of SharePoint is released…We believe it is this kind of commitment that is allowing us to expand our customer base rapidly", says Rehmani. When it comes to training end-users, Rehmani adds, “Training programs may help get things started, but when it comes to increasing and sustaining an appropriate usage level, their effectiveness is very limited". The reasons for prioritizing a context-sensitive help system over training programs is explained further in this article. Already deployed in over 200 enterprises, VisualSP now serves more than 2 million users. To see how it works, explore a live demo here. To get more information about VisualSP, call 616-610-1082 or send an email to jordanv(at)visualsp(dot)com.